VS1063 is an easy-to-use, versatile encoder, decoder and codec for a multitude of audio formats. 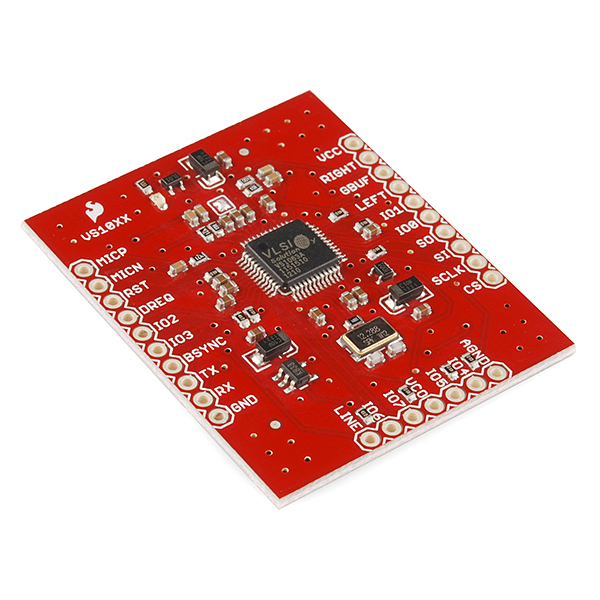 With this breakout board, it's easy to drop it into any project. The VS1063 is capable of decoding Ogg Vorbis/MP3/AAC/WMA audio and encoding MP3, IMA ADPCM and user-loadable Ogg Vorbis. This breakout can also drive 30 ohm headphones with no additional power supply..
Is this out of stock or out of production? Can I simply connect this and use it without any programming etc? i.e. is there a hardware mode etc? How many layers does this board have? 4? Nah, it's just a 2-layer board. I'm trying to understand how is the ground pin connected (in the eagle files)... to me it looks unconnected, but I'm new to this stuff... is it really so? Usually a ground plane. By default Eagle doesn't always show you the ground plane, but basically anywhere that doesn't have a trace is just a big copper plane that is usually used for ground. This is the case on both sides of the board. So it may just look like a small wire to nowhere, but its going to the ground plane. what voltage is needed at VCC? ive heard 3.3v and 5v and really dont want to blow up the chip! Good question! The max of VCC is set by the max of the on-board regulators, which'd be about 6V (the max of the SP6214 2.8 and 1.8V regulators). The minimum of VCC would be about 3.3V. It's my understanding (subject to being wrong) that no, patches are not permanent, which is why you load them after every powerup. If you have the space (there's only 32K total), there's no good reason why you couldn't store it in the Arduino's flash and load it from there. Also note that if you don't need the specific features of a patch, we've had good luck with the bare ROMs (in other words, we usually don't need the patches). EDIT: more authoritative answer: no the patches are not permanent and if you wish to use them they must be loaded on each powerup of the VS1053. And if anyone, like me, is wondering how to load it from flash: http://arduino.cc/en/Reference/PROGMEM. Please read more of the datasheet. You can use MICP and MICN as a single differential input, or set up the registers to use it as left and right inputs. Please identify a compatible microphone and add it to the related products section. I ordered the MEMS mic BOB. Can/should I connect GBUFF to MICN to match the VCC/2 floating output of the MEMS mic? The datasheet specs the MIC pins as "self-biasing"... ?? The MEMS puts out 200mV p-p but the datasheet indicates 140mV p-p as a maximum to avoid distortion. Will the MEMS mic damage this module? If not, will the sound quality be ok? Can this board play more than one sound file at a time? If not, can someone recommend a board that can? This chip can only decode one audio file at a time. To do more you'll likely need to step up to a beefier microcontroller, like the Beaglebone or Raspberry Pi, and do it using software commands. I bought this board mainly for a future project where I will be needing bidirectional audio. As a simple test I modified the sample driver from the VLSI website "Microcontroller Playback and Recording Example using VS1063" to work with my microcontroller (ESP8266) and was able to play back an MP3 file I had stored in flash memory. The form factor - You can't use this on a breadboard, it is two wide, forcing me to use two breadboards, additionally they have the 7 pins going along the bottom which forced me to solder a header going the opposite way. Only the XCS chip select pin (Labeled CS on the board) is broken out from the VS1063 while the XDCS pin is not, which forces you to use SM_SDISHARE mode where the SCI and SDI share the same chip select. This isn't good for when you are using other devices on the same SPI bus because when your chip select is low the SDI will be active, so if you tried to talk to other SPI devices with your microcontroller, the VS1063 SDI will be getting (and maybe sending) data at the same time. This is literally one extra pin so I'm not sure what the cause of the oversight was on this. 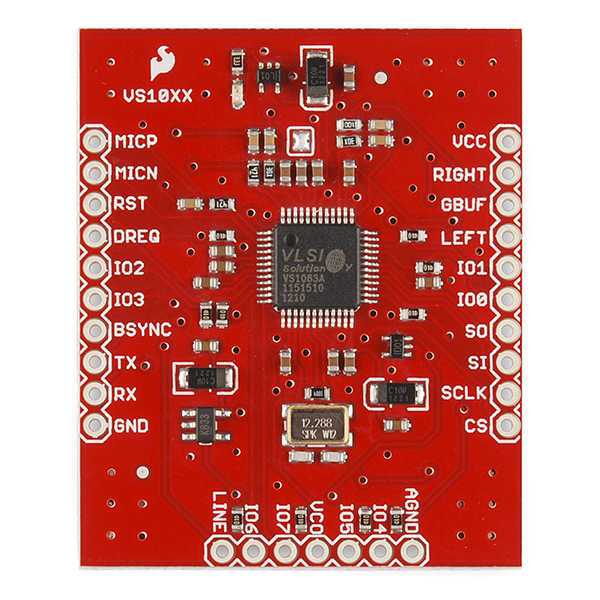 Additionally I managed to blow the board out by accidentally touching the VCC pin on top of the PCB, and this breakout board is out of stock or no longer available? 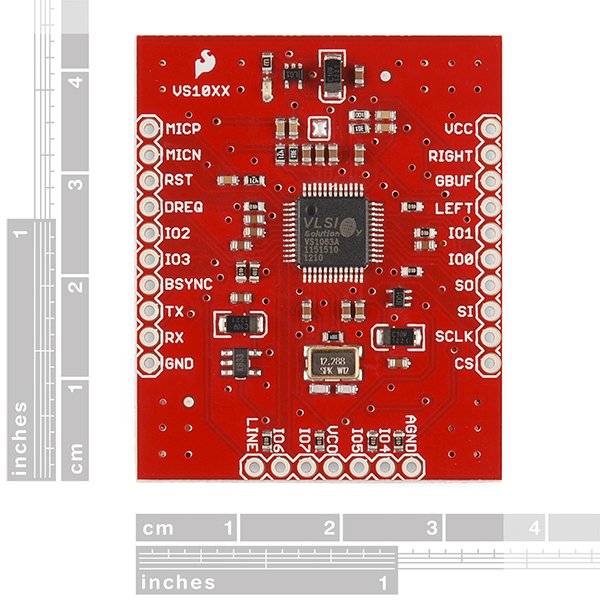 So I will be resorting to buying the raw VS1063 chip from Sparkfun and either replacing the one on this board, or buying a VS1053 breakout board that has the XDCS pin broken out and swapping the chips (the pinouts are the same for the 1053 and 1063, only the various registers are different). Not having the XDCS pin broken out isn't a huge deal for me at the moment because its only 4-5 lines of trivial code to use shared mode instead, and I don't have any other SPI devices, but in the future I will be using a TFT display on the SPI bus so I will have to find another solution where the XDCS pin is broken out. Has any one successfully gotten this board to work. ? I bought 2 of these boards and for weeks I still can't get this board to respond to a simple spi command. I thought the first board was bad so i got another one and this new one still doesn't work. I started researching this and there is some confusion with vlsi solution saying some of these board has wire missing that needs to be pull up to vdd. 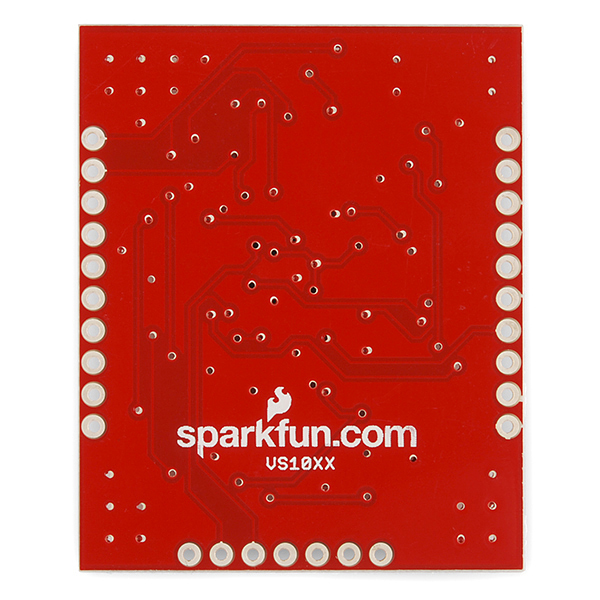 I'm disappointed with this product because i ask sparkfun to test this board before they send it to me and clearly they didn't test it. If there is a known issue with this board then why are they still selling it on the website. Why hasn't it been removed. I'm sorry, but we do not offer hand testing of products for customer purchases. It's simply not an option we can support. Though those boards are hand tested before being released from our production process. Each unit is checked to ensure it plays a proper test sample out of a speaker. To have 2 units over 2 orders that are both not working is strange. Please contact our support team. They'll be happy to help you trouble shoot. We will likely need to pull both boards back for inspection and testing. If there is a manufacture defect found, we'll certainly help you with that.